Although links and publishing content are important, today’s search engines are much more complex. They’re no longer relying on traditional text and document analysis for ranking indexes. Instead, today’s SEO is seen as an organic ecosystem. What this means is that each small code snippet will either directly or indirectly tie into the way your website performs. Of course, if you have a slow website, link building and content publishing are useless. Instead, here are some best practices you’ll want to follow – just make sure that you follow all of them because alone they won’t work. Your content is relevant to your users’ needs: See what content is ranking for it, and optimize content properly around them. You include long-form content (a.k.a. deep content – 2,250 – 2,500 words in length): Search for your keyword’s top-ranking pages and analyze their content. Make sure you add some of your own semantically related keywords to flesh out your content and include sub-topics. This helps answer your users’ additional questions. Your content is organized: Make sure to optimize your title, page and header tags, as well as your URL slug so search engines know what your content is about and users find it easier to scan and read in 5 seconds – something that works best when you have header sections. 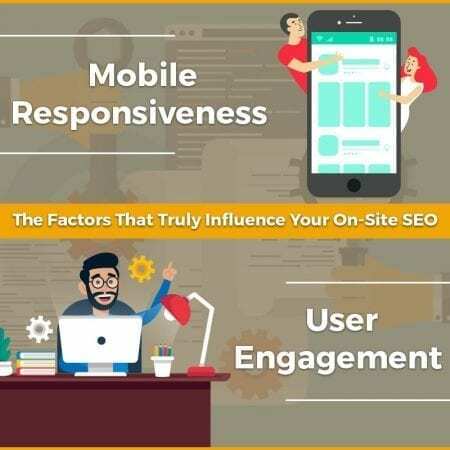 Increasing the number of pages a user views before leaving your site by searching for ways to keep visitors around longer; including calls-to-action whenever possible; and offering additional navigation options in your content (e.g. interlinking related materials). Decreasing your bounce rates by including compelling hooks; getting rid of pop-up advertisements; making your pages load faster; and making sure that your landing page’s copy is relevant to search queries. Keeping your click-through rate (CTR) low by inserting exact match keywords in your title tags and meta descriptions; telling people why they should look at your page (e.g. a BOGO offer); and making sure that your tags aren’t being truncated. Crawlability: Search engines must crawl your site if you want listed. To do this they’ll use your sitemap and interlinking. Use CMS to create your sitemap and to block any pages you don’t want crawled. Security: HTTPS secure websites are valuable for doing business with your customers and with Google too. Make sure your host has and implements a valid SSL certification. You should also rewrite your .htaccess file so all your website’s traffic is redirected to a specific domain. Deep links have always been important. You want to make sure that all your pages are linked to a higher category page that passes authority onto them. This will also encourage users to spend more time on your website. The best strategy here is to strategically include at least two additional links in each post leading to other parts of your website. Your website’s hierarchy communicates each section’s purpose. To make this work you must know what your customers are searching for. Optimize each of these categories based on exact match keywords and semantically related keywords for your sub-categories. Make sure to use a responsive web design. Use CMS to tag your pages with AMP code. Minimalize onsite resources to improve your page speeds. These are the foundations you’ll need to check for when you’re building or auditing a website. Having a holistic viewpoint will help you survive the ever-changing algorithms. For additional help here, contact Affordable SEO Company.